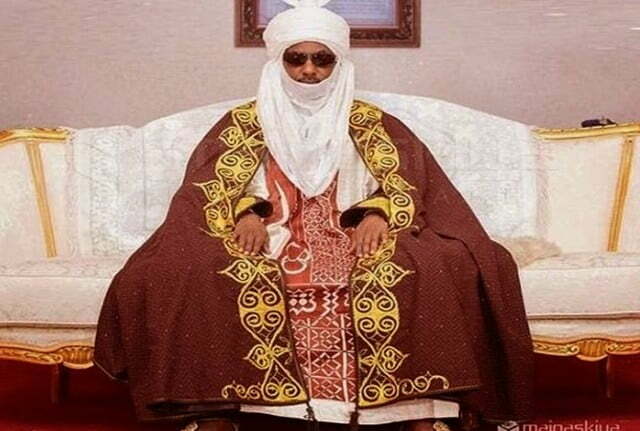 The Emir of Kano, Muhammadu Sanusi II has blamed the federal government for the killings in the north central part of the country. In an interview with The Punch, the emir claimed 800 herdsmen were killed in Taraba in 2017 but the government failed to take action even when he presented evidence. He said: “Some months ago in Mambilla, in one weekend, over 800 Fulani were murdered by Mambilla militias. The papers did not even go there to cover the story. Most of those wiped out were women, infants and the elderly. “In one case, a pregnant woman was killed, her stomach was ripped open and the baby was brought out and slaughtered. I personally handed over to the Federal Government a dossier with the names and pictures of the 800 or so people slaughtered as well as the names and addresses of persons known to have participated in these acts of ethnic cleansing. “Nothing has happened. I also ensured that authorities received video and audio evidence of senior politicians in Taraba State, who were involved in this act of genocide. No one has been arrested. Fulanis were also murdered in Kajuru and Numan. “In many of these cases it was not about conflict but militias raiding settlements to kill women and children, and then later, attacking herdsmen and slaughtering them and their cattle.” Sanusi condoled with the people of Benue for the recent herdsmen attack but rejected insinuation that the Fulani were attempting to take over the country. He said: The point I am making is that we are living in a country that has failed to protect the lives of people on all sides and bring culprits to book. Also in the case of the Fulani, there is a deliberate attempt to ‘ethnicise’ criminality, and politicians, who are total failures, have found the anti-Fulani rhetoric to be the way to get popularity.” “The Sultan of Sokoto, the Lamido of Adamawa and I have been quietly speaking to top security personnel for months; telling them that the failure to provide justice and the clear involvement of political leaders in genocide, especially in Taraba, is causing anxiety. “The case of Taraba is particularly bad. In the days of (President Olusegun) Obasanjo, an act of cleansing, similar to the recent one, happened. A politician, who was identified by an investigative panel as a key man behind the genocide, was simply appointed state attorney general by Governor Danbaba Suntai and he made sure no one was called to account. “In the recent genocide, a top local government official, on whom there was evidence of involvement was removed, then given a political appointment in Jalingo in the Governor’s Office.” Sanusi said he has appealed to the governor of Taraba state to delay the implementation of the anti-grazing law to no avail. He said: “I fully support all efforts to attract investment into cattle rearing. This is global best practice. Capital is put into development of ranches and grazing areas, herdsmen settle. Their cattle are healthier and fatter, they sell milk and milk products and beef, their children go to school and they are economically much better off. He admitted that he, the Sultan of Sokoto, the Emir of Katsina, the Emir of Zazzau and the Lamido of Adamawa were patrons of the Miyetti Allah Cattle Breeders Association of Nigeria. “As I understand it when Miyetti Allah was first set up, they requested a few Fulani emirs to be their patrons in their capacity as emirs. The first grand patron was Sultan Abubakar III and he was replaced by successive sultans – Dasuki, Maccido and Saad Abubakar now. “Other patrons were emir of Kano, Lamido of Adamawa and emirs of Zazzau and Katsina, I believe. So, my predecessor was a patron and on my ascension to the throne, I became a patron. This is all nominal. “It is, however, committed to protecting the fundamental rights of herdsmen as Nigerians including constitutional right to freedom of movement and the ownership of private wealth and peaceful conduct of their business.” “Grazing routes have been taken way by politicians. We have demographic implosion in the North, desertification, reduction in water reserves and competition for resources among various aspects of agriculture – crop production, animal husbandry and fishing. “What we see is the failure of political authority, the cynical manipulation of ethnic identity by failed governments and the impotence of our security machinery. Instead of being dragged into a debate on whether Fulani are trying to take over peoples land – which is a daft argument – let us try and bring some intelligence into this discussion on weak governance rather than emotions.” Meanwhile, the federal government appealed to the media and public commentators to exercise utmost restraint in their coverage of the fallouts of the recent farmers/herders’ clash in Benue. The minister of information and culture, Alhaji Lai Mohammed, who made the appeal in a statement in Abuja on Saturday, January 13, cautioned against “incendiary comments, unrestrained use of pictures and footages that offended human sensibilities” in the coverage of the crisis, The News Agency of Nigeria (NAN) reports. Mass burial organised by the Benue state government for victims of herdsmen attack.